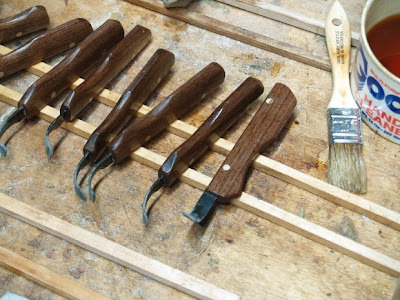 The spoon knives have their walnut handles now and are finished except for rubbing out the oil finish and sharpening. 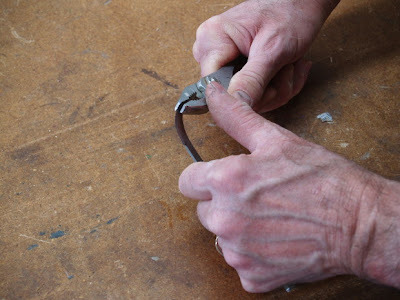 To sharpen I wrap a dowel with 800 grit sand paper and stroke in the curved section of the blade. The convex side will be honed on a fine sharpening stone. The knife handles are now glued together and drilled for the brass pins. But the block shape will have to be changed so they fit the hands. 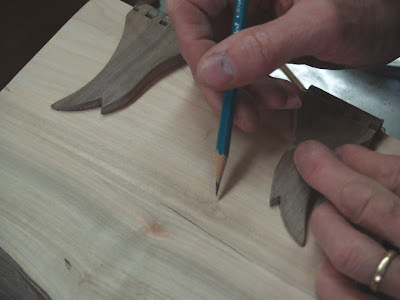 What you see here are left and right designs, and when I get these shaped and finished, I'll show you how to use one. I have sanded the wood flush with the blade on the first half of the knife handle, then I drilled to finish the holes from the blade through the wood. If I didn't do that first, when both sides of the handle are in place, I would be unable to locate the holes for the brass pins to fit. In the photo you see gluing on the second side of the handle. I am careful to glue the piece with perfectly matching grain, so both sides of the handle look as though cut from a single piece of wood. Can you imagine making knives for use in a conventional public school? Nearly any object can be used as a weapon. Just think about he game and movie, "Clue." Now who was it that was killed with the lead pipe? But knives have always been tools. It is only through the darkness of modern imagination and the stupidity of gaming and television and the fears that arise from them that we have been deprived of this essential tool of human creativity. Welcome to the dark ages. For earlier steps in making this knife, read below. Step by step. The spoon knives are now glued with epoxy to one side of the handle. You can see how it nests in the groove cut in the last step. 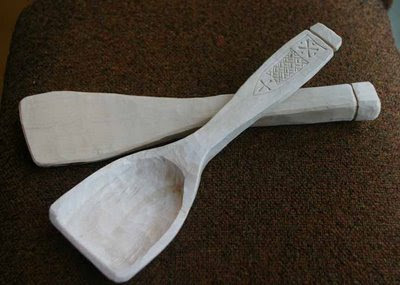 I am making 15 knives so I will have plenty for spoon carving with the kids at Clear Spring School. I used quick setting epoxy so the next part of the assembly will take place in the afternoon. Since we had snow last night and it is cold in the shop (I haven't bothered yet to light a fire in the woodstove.) I will give plenty of extra time for the glue to set. If you were to look really close, you would see that a portion of the knives are made for left hand use. You may have heard that "left handedness" is on the rise. We have moved from a historic low of 3 percent during the dark ages of education in which children were forced to write with their right hands to 11% today. McManus’s team have reinforced the theory that left-handedness is growing by analyzing film shot about 1900 which shows that only 16% of those living at the beginning of the 20th century used their left arms to wave, compared with about 24% of people today. Twenty percent of my spoon knives are being made for lefties. 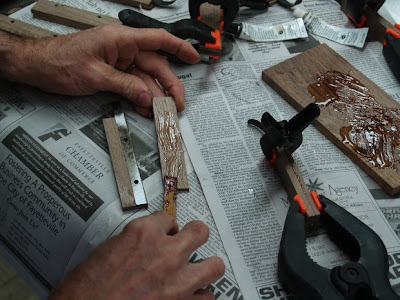 I am now making walnut handles for my spoon knives as shown in the photo above. You rip stock into two thicknesses. 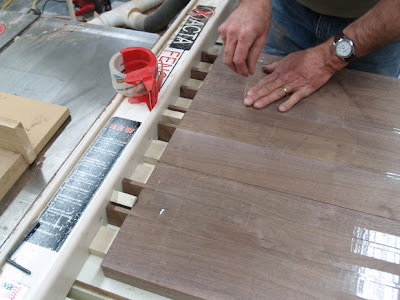 Then make a cut as shown in the edge of the thicker piece. Note that the depth of cut equals the width of the knife blade and the fence is set so that the blade removes the amount required to allow for the thickness of the blade. Next comes some epoxy glue, attaching one side. Then the holes will be drilled for brass pins. Next, the other side will be glued in place, drilled and brass pins will be added. Finally, the handles will be shaped to comfortably fit the hand. I have created a new group in the network site, LinkedIn, which I hope will become a resource for discussion and advocacy of hands-on learning. Join the network and send me a request to link in. This afternoon, I have been once again competing with the Chinese, but it is a friendly competition. Those of us who make rather than merely consume are brothers and sisters in hand, beauty and creativity. I have been worried about the global economy, but when I am busy making things, my heart is at rest. I work unconcerned. My uncle Ron used to visit, and he would ask, "Are you making anything big?" "No." I would reply. "Just more boxes." (thousands of them over time.) Making boxes has been my therapy, solace and strategy for hard times. When I had gone months without furniture commissions to work on, I applied myself in making boxes. The inventory might build for a time, and then the dam would burst. The orders would come, and the time some might have thought I was wasting enabled me to survive as a craftsman and maker of larger things. You can find a few of my boxes on Etsy. Visit, order from my shop. You too can be one who proves the value of great faith. Now they are in the oven being tempered. Four hundred degrees for 25 minutes, then cooled to room temperature. After that, walnut handles will be added. My thanks to Larry Williams, Clark and Williams Planemakers. Larry gave me hints on hardening and tempering steel and provided scrap steel from making plane irons for use in making these knives. 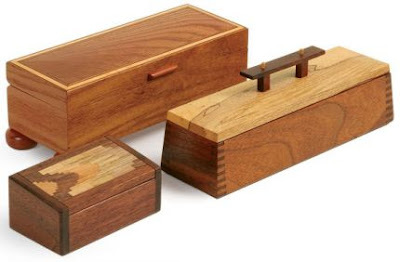 Those who make dovetail joints in woodworking may be interested in this new technique, particularly if you are making a set of dovetails as large as these. 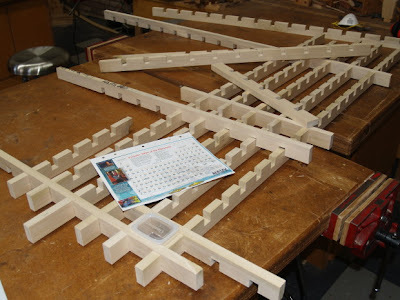 You cut the pins using the table saw, then reassemble the parts, slightly offset to form the pins. The loss of grain continuity is minimal. And the glued joint, if done well, is as strong as the wood. 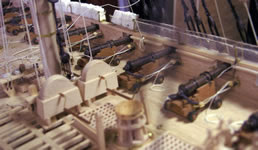 The wood must be clamped in all directions to keep the pins from sliding up as clamping pressure is applied to the sides. 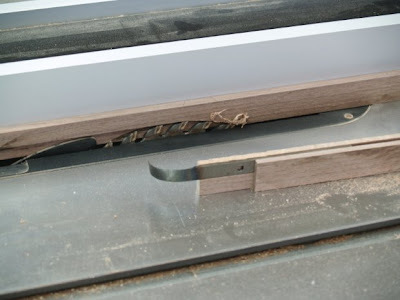 Wooden strips are clamped on both sides at the ends to hold the parts in alignment and wax paper is used to prevent the strips from sticking to the workpiece. Here in the city of Eureka Springs recess has been eliminated from public middle school. Most Americans from all cultural backgrounds are more familiar with “direct instruction” teaching methods based on teaching discrete skills isolated from children's interests and activities. But research shows that the exploratory and creative activity that young children initiate themselves (play) is the primary way they develop concepts and understanding about the world. Play helps children develop the skills necessary for critical thinking and leadership. Play is how children learn to solve problems and to feel good about their ability to learn. I'm sure the school has its reasons. Perhaps more time is required to prepare for government mandated standardized test. Teachers want the children to do well at those so they will be rewarded with incentives and bonus income. Or perhaps children, being unschooled in problem solving are mean to each other when unsupervised, and therefore not to be trusted on the playground. Either case spells decline for our nation and for our children. When our actions are in direct conflict with what we know to be true, we descend from rationality to chaos. 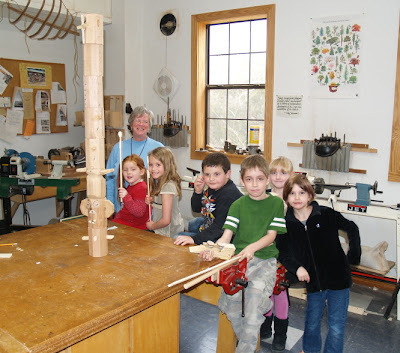 The photos above and below show some of what has been going on at Clear Spring School. The 3rd and 4th grade students have been finishing their models of the solar system. The Chemistry students have been assembling the various elements for their periodic table, and today we began assembling the framework in which it will be displayed. Pet Golden, our math and science teacher is excited about this project. And one of the things that is often forgotten in public education is that teaching is best when the teachers are creatively engaged in the subject material and the teaching process. And finally, we are making great progress on the bench for Crystal Bridges. 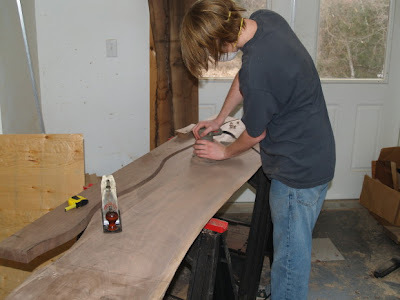 The rough shape of the bench has been determined and the boards are being sanded by my high school intern Luke. 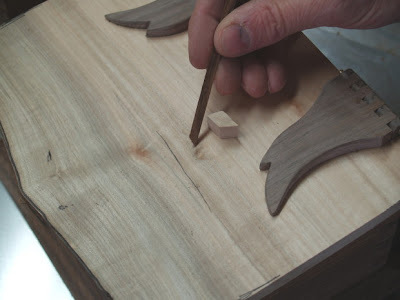 I have a new technique which I am applying in making dovetails, and though I won't explain it all now, you can see a hint in the last photo. 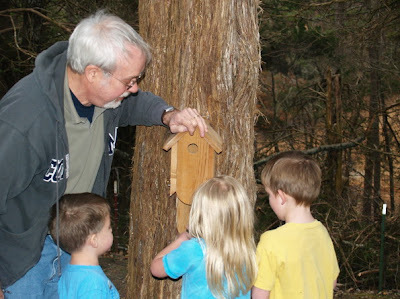 These photos are of making a wren house with the Clear Spring School Pre-school students. I had pre-cut the parts, but the kids were very proud of their hammering. Nathan says he has his own tool belt and thinks the birds will find the box in four days and begin building their nest. Aleena says the birds will build their nest in the spring. Fine Woodworking has a contest online, Building outside the box. Some of you may recognize my boxes in the contest introduction page. I live in a relatively small town in Arkansas and it seems the recession is gradually growing our way. First many in our local retired community were hit by the steep decline in the stock market. That in itself brought a serious decline in available local resources. Then those of us whose incomes are drawn from outside the community have watched as our incomes have declined. Artists who travel to shows report business being down. Galleries in the cities that sell their work have had declining sales. As a tourist community, it seems people are still coming but spending less. That means the restaurant business is slow and the gift stores and galleries have declining sales and are selling inventory at a loss. I have noticed the recession in my own business. An article has been postponed and a book put on hold. I no longer have customers inquiring about custom furniture, and the sales of my boxes to galleries has slowed nearly to a halt. So, like nearly everyone in America I am looking at my options, considering new opportunities and income strategies. Of equal importance is the process of reexamining our current use of financial resources. National Geographic this month has an excellent article on the waste of resources that takes place in the common American home. The article offers changes that come at almost no cost. Our past profligacy is the result of our misperceptions of abundance and we are currently coming to terms with reality. My hope is that this will lead to better and more responsible use of the earth's resources. 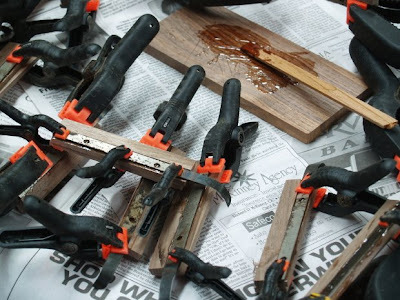 One of the things you learn in the process of woodworking. You have a board. There is only one that shows the qualities desired in the finished work. You are frugal and caring in its use. Today I go to the preschool to make a bird house, and this afternoon I work on the bench for Crystal Bridges and the table of elements for high school Chemistry. The fifth and 6th grade students finished their puppets today and the 7th through 10th students are almost done with their book holders. The photo above shows puppets. Evidently a great deal of interesting research is linking internal rhythm, even inside the brain with external symptoms of disease and stress. Alter the fundamental processes and rhythms, and what do you get? Life itself is experimental and we are finding out. I have had this suspicion that video gaming, television and even some forms of music can detract from internal balance and ability to learn and engage with others in cooperative activities. At this point, for me at least, I have simple observations as a craftsman about these things. And I am pleased that others in the Scientific community are investigating. I am grappling with the interconnected concepts of rhythm and pattern, inspired by a conversation with an anthropologist. In the conventional explorations of self, we tend to regard ourselves and others as physical specimens. We examine the structure and form, and yet, by ignoring rhythm and pattern we overlook the essence of our humanity. 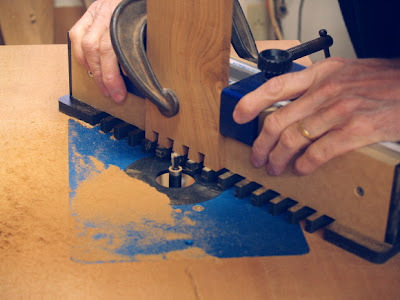 When you make something from wood, you engage the rhythms of the body... sawing, planing, sanding and hammering are timed in conformity with rhythms, internal and unseen. Unfortunately, in schools, we expect children to conform to structure that inhibits the natural expressions of rhythm. When constrained, those expressions take the form of clicking ball point pens, scratching on coarse textures, or drumming on desks. And what are the physiological and cultural consequences? As I say, I am grappling with this. Perhaps my anthropologist friend will help. And I invite you to share your own thoughts. When Kahlia is a horse, I look up in the woods and recognize her by her gait. Tyler is flying, a ninja, forked stick at his side. Where will he land and what evil will he slay? There are important rhythms we must explore in order to understand, teach and learn and they are most often expressed through the hands. Today the 5th and 6th grade students will finish their anatomical puppets. 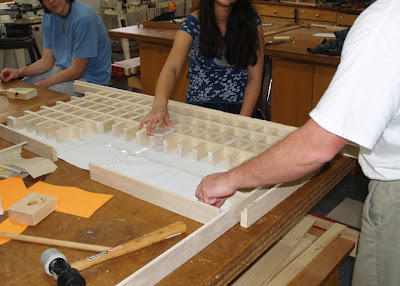 the 7th through 10th grade students will work on book holders. The vivid sense of the morally good and beautiful are things you can learn through skilled craftsmanship, and are the Wisdom of the Hands. Charles Darwin's theories have been characterized as survival of the fittest, but if you take an honest view of life, you see that that those who survive are those best suited to fit a cooperative framework, each part in some way sustaining and nourishing the others. Human beings have grown in an ever expanding circle of cooperation, or at least did so until recently. Throughout millions of years of "primitive" existence men recognized relationship with the other living things as being sacred. We grew from family to tribe to nation state and now to internet global economy, each part in some level of sustained but sometimes strained cooperation. It is now time to remember what was forgotten... Our sacred relationship with all species of the planet, and our responsibilities as guardians of all life. That sounds like a daunting task. To move from the selfishness of the me first Reagan era to a new level of world-wide sensitivity and cooperation. But remember that we have the full thrust of evolution on our side, a billion year momentum toward ever widening spheres of cooperation. In that we have the power and potential to awaken to greater consciousness. What we face at this moment has been called a convergence of crises. Economic collapse and global warming. Things may not look good. But we are at our best when the most is required of us. 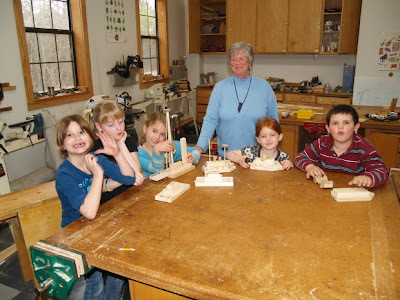 Today in the woodshop at Clear Spring School, the first and second grade students will make friendship boxes and the 3rd and 4th will finish their models of the solar system and do projects from paper sloyd. Casulo, an apartment full of furniture that fits in a box. A study of the art of primitive peoples shows us that one form of art invariably begins with an attempt to decorate an article that has been constructed for some practical purpose. This seems to be a natural sequence. When one gets control of a practical activity the aesthetic impulse seeks its opportunity, its medium, for expression as an accompaniment of the practical. The utilitarian product expresses the purpose of the worker; the decorative element expresses the emotional attitude. This feeling may be pride in the result of the labor, or in ownership of the product, or a sense of joy in contemplation of what seems beautiful in decoration itself. I finished Malcolm Gladwell's book Outliers, The Story of Success. My wife and I are deeply engaged parents, supporting our daughter's interests and education. There are many of us in the world, though perhaps not enough. As outlined clearly in Gladwell's book, success is built on two factors, timing and commitment, not only in the individual, but in his family, community and culture. There is not much a person can to about timing. There are lucky things that happen to lay paths toward success, and I won't spoil the book. But why is it that the bulk of parents are so disengaged in their children's success? That is the subject of my amazement. 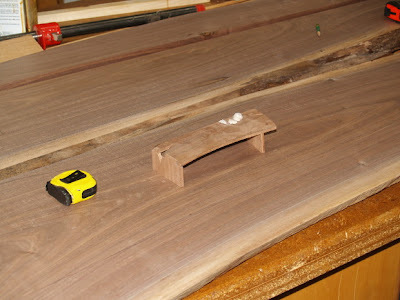 Today I am preparing for tomorrow's classes and working on the walnut bench. I was reading the current issue of Fine Woodworking and was surprised to find myself on the cover of a new publication. 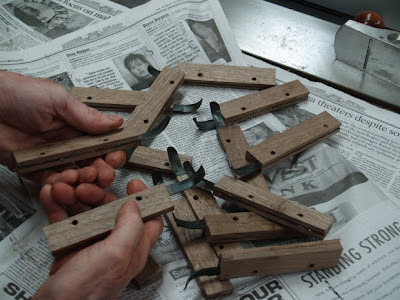 Essential Shopmade Jigs will be available on March 31 through Taunton Press. Click on the image at left and it will become large enough to read for ordering your copy. Free shipping is offered for copies ordered before March 4. I was talking to my mother last night, and those of you who have read deeply into the blog would know that she is a retired kindergarten teacher. She thinks that working with children is the most joyous and honorable of professions. So when I mentioned that my daughter Lucy is working with kindergarten students in the Columbia University day school as her on-campus employment, my mother was excited. "Do you think she will change her major?" She asked eagerly. As I mentioned, I am reading Malcolm Gladwell's book, Outliers, the Story of Success. The book is about the factors contributing to success and focuses on the big names, like Bill Gates and the Beatles. But what is success anyway? Is there a single point at which one can be considered a "success?" Or is it best measured in smaller increments and met moment by moment in our own lives? And what about joy? I have been engaged in a struggle with design and materials. 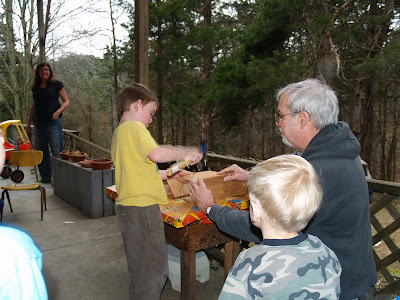 I am making a bench (with children's help) for the new museum in Bentonville, Arkansas, Crystal Bridges. The walnut was supplied from the site, and when I got into the pile of it, I found much of it to be splintered and cracked. I am having to be very frugal and specific in the use of each piece. So I have been awake nights thinking about it and have a deadline of March 27. In the making of real things success or failure is measured in very small increments. The photo above is of the walnut and a model of the intended design. 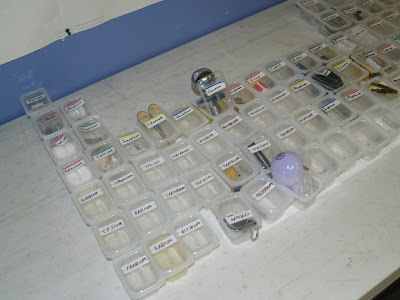 The photo below is of the current high school chemistry/woodworking project, making a periodic table of elements using wood and baby food containers to hold the elements. Brad Walseth from Custom Woodworking Business magazine wrote an article about my work for the February 2009 Issue. The article can be found online here. 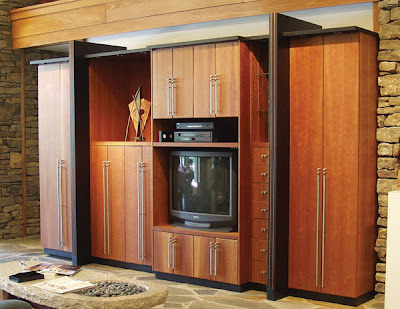 The entertainment center is the lead photo in the article. I am currently reading Malcolm Gladwell's latest book, Outliers, The Story of Success and even the first chapter is a doozy. I was one of those November children who started kindergarten as the youngest in the class, and Outliers starts out by illustrating the age based advantages given to those who are larger and more mature whether in athletics or in school. It helps me to understand why I didn't make the little league team, but it also helps me to better understand why school can be a crippling experience for some. It illustrates how even the very simple things like date of birth can have profound implications. We run grave risks of debilitating some even as we lift others. How do we change that? I think schools like Clear Spring School are the answer. Smaller class sizes, more personal child centered learning, schools that allow for variation and individuality in child development. Is a drawing worth a thousand words? 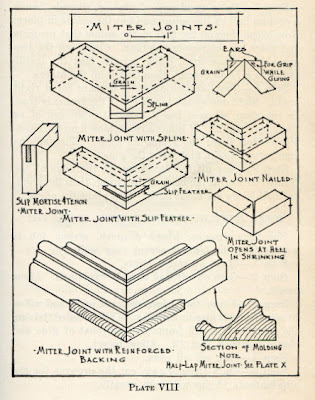 This simple drawing of miter joints is from William W. Klenke's 1925 book, Joints and How They Are Made. If you want to know how something looks, "a picture is worth a thousand words." If you want to know how something is made, a drawing can be worth even more, being beautiful as well. It is one more thing not taught in schools today. 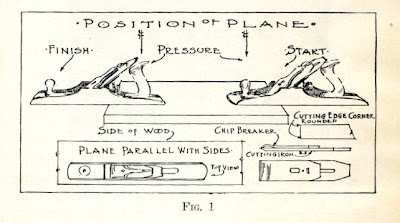 One of my favorite woodworking authors was William W. Klenke who wrote books for the Manual Arts Press, the publishing company of Charles A. Bennett in Peoria, Illinois. I just acquired this lovely classic, signed by the author for $10.00 plus postage. 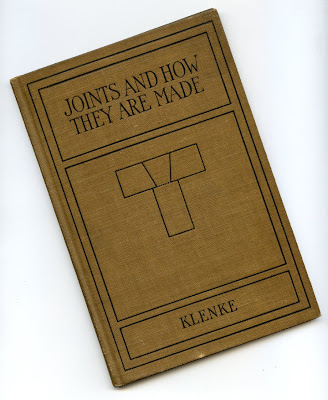 Joints and How They Are Made was published in 1925. What I like best about Klenke's books are his beautiful line drawn illustrations like that shown below. Michael Pollan wrote an open letter published in the New York Times to then President-Elect Obama outlining a new strategy for American agriculture. Part of his proposal is that Obama begin raising some fruits and vegetables on the White House lawn. His letter can be read here! Those things that are taken out of our hands are no longer subject to our control. Michael Polllan's letter is a matter of common sense. But people who have not been hands-on engaged in reality don't have it. It is what we get when we forget to have schools in which children learn by doing. In the meantime, please read Michael Pollan's letter. It is a masterpiece of forward thinking placed in historical perspective. 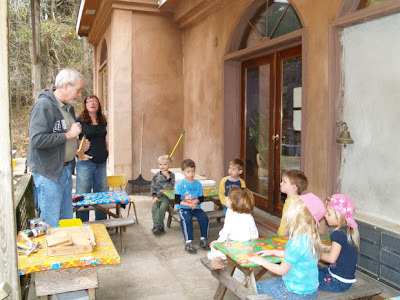 At the Eureka Springs School of the Arts, we have a new blog to help stay in touch with students, faculty and community. Please check it out. You will find information on our classes and instructors, and will find it to be a great way to learn interesting things about the Eureka Springs Arts community. Boats, solar systems and what we spend our money on. This morning the first and second grade students made boats for an imaginary journey to Australia, their next subject for study. They will plan their journeys on a map and the boats are the first part of that. More will come later. 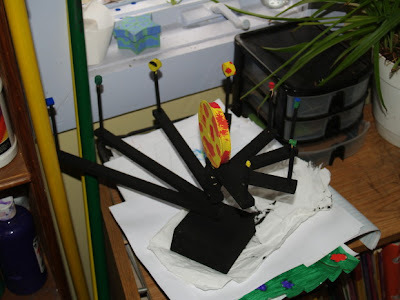 The 3rd and 4th grade students continued making their models of the solar system, and those who completed theirs began projects from Paper Sloyd. Last night I went to a bonfire at a friend's house and a fellow guest mentioned that the eight years of Bush Presidency proved that government spending did not stimulate the economy. I chose not to argue at a social engagement, but here in the blog, I can say what I want and you are welcome to respond. While the eight years of Bush presidency I regard as a national catastrophe, the subject of government spending should include the discussion of what we are spending money on. For instance, with the money I am spending on my daughter's education I could afford to buy lots of things that would all be consumed in a set number of reckless and bizarre days of foolish glory. I could list all the possible foolish and dumb ideas, but as a practical man, my mind can hardly go there. Starting an unnecessary war is a lot like getting drunk and spending all your money on fireworks and watching them all go up in a single whooof. Start one and your nation may end up scorched and scarred for life. So there is a clear difference between spending on blazing idiocy and investing in the lives of our children. This is not a difficult concept to get your hands on. If you disagree, please feel free to use the comments function of this post. Republicans are crying foul and are clearly more interested in the failure of the Obama stimulus plan than in its success and the success of our nation. I hope people are wise enough to see the difference between spending for dumb-assed things and spending on investments that make us better and stronger as a nation. 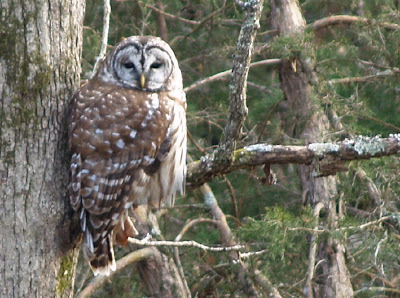 My barred owl was hooting outside, and sat for a time on his favorite branch, but he flew away before I could get my camera in place. But perhaps I'll get a chance later or another day. 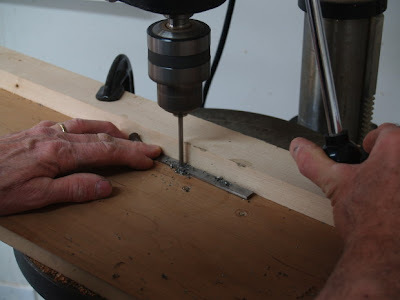 Today I am making a pivot fence for the new router table, complete with dust collection connection. 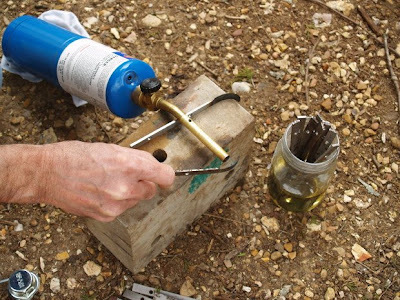 The advantage of a pivot fence is that it is extremely easy to make, clamps firmly in position with a single C clamp and can be micro adjusted. You only move one end and the distance moved in relation to the cutter is only a fraction. So for very precise adjustment of fit, it can't be beat. During a President's day holiday at school we had inservice meetings as a followup to our classroom observations a couple weeks ago. The idea was that by taking time to observe in other classrooms and share commendations and recommendations, we might help each other to better conform to the school mission of providing hands-on, hearts engaged education. What do we do if it looks like the world is falling apart? We gather our resources and hold them tight or if it looks really bad, we pass them out to family and friends as life preservers. It is what the big banks did with the TARP money. Lend it out as requested? No, they would rather distribute it to friends or hold it firmly in their grubby hands. We have real problems. The driving principles of past administrations' economic policies have been Ronald Reagan's. You put money in the hands of the wealthy, and they will know what to do with it. Trickle it down, dispensing it and investing it through their ultimate wisdom to the lower classes. The rich would create jobs, putting people to work. They would create the ideas moving our economy forward through their hunger for even more wealth. After all, in the Republican scheme of things, if you have more money and are more neatly dressed you must be more intelligent and of greater moral standing than the common man on the street! But if you've never done anything before in your life, if you have no well developed skills, no sense of your own potential in the development of beauty, no sense of community or connection, how can you be expected to invest in the lives of real people? It's a risky business. It takes wisdom and effort. And who in their right wing mind would take such a leap of community and faith? 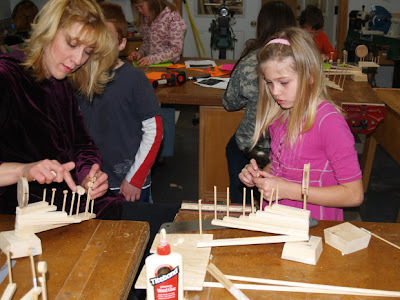 But what if we were to have work shops in schools to supplement classroom learning? Our children would be challenged not only with ideas but with the use of those ideas to better the lives of their families and communities. In consequence they would grow into adults with greater understanding, compassion and imagination as well as the impulse to create, not only in their own lives but to build the lives of others. 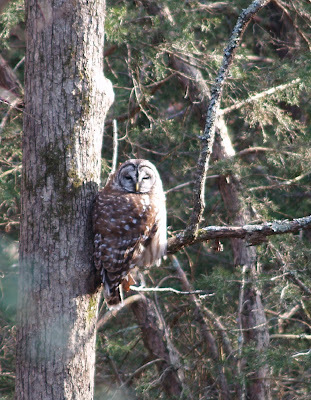 I thought you might like to see one more closer view of my Barred owl forest friend. He looks like a gentle forest creature, but get much closer than this and you would have a face full of feathers, talons and sharp beak. 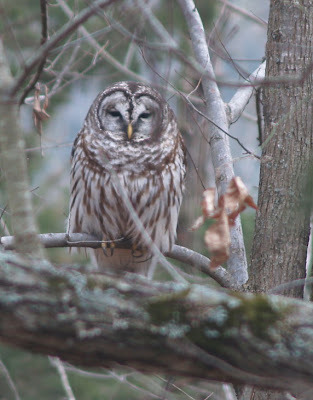 I stepped outside for a moment and my barred owl neighbor lifted off the ground, startled and flew up to a tree where he could watch me without feeling threatened. Later I began watching from inside the shop for him to perch on his favorite tree. Not a bad photo when you realize it was taken at a 60 degree angle through a double pane glass window in the shop which is long overdue for Windex. The photo below is taken later when I stepped outside with the camera. He flew further away, so this isn't the closeup I hoped for. Perhaps that will come another day. Today the boxes are assembled, the hinges are glued in place, and I am applying the Danish oil finish. I wait about 30 minutes or so between the first two coats, and then will rub them out with a dry cloth in another 30-45 minutes. One more coat will be applied tomorrow. Glue doesn't like to be hurried, so I will give the boxes some time to themselves as I wait for the now glued dovetails to set. This is the last you will see of these boxes unless you subscribe to American Woodworker or pick it up at the newsstand and want to see the complete step-by-step. I reserve the right to post a beauty shot of the finished boxes, perhaps tomorrow or Monday. When you make something that is beautiful, or useful, or illustrates some new skill, whether it is in the workshop, kitchen or garden, there is the desire that arises within oneself to share it with others, and even though I've made thousands of boxes, I still feel that need to share. The most amazing thing is that our educational system has been created by those who have little sense of this. How do I know? It is obvious, for if they knew the potential power of their students' creative spirits, the design of our institutions would not be what it is. Schools would be workshops with tools through which concepts would be explored in the making of things that gave greater meaning to the children and their lives within family and community. And that being so, we would live in a culture richer than what we have today. This month's Fine Woodworking is exceptional, with articles about thin kerf blades, lots about hand planes, and an article about fixing minor defects in wood. It is a technique I've used many times in the past, and since I had a small and distracting defect in the lid of one of the boxes, I decided to use it again. 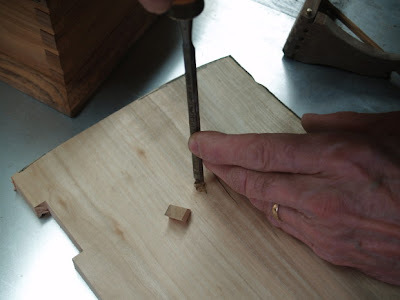 You make a small diamond shaped piece of wood in a matching color, then place it over the defect, trace around it and chisel out the space for it to fit. I used a 1/4 inch Forstner bit in the drill press to remove most of the waste before chiseling. This provided a target depth and made it much easier. Then I glued the diamond of matching wood in place. Use a pencil to sketch in some of the grain to complete the effect. While attempting this technique on multicolored spalted maple is not as effective as when used on more uniform colored stock, you can see that it works! The photo at the top shows the ding. Photos below show the fix and the result. If I weren't pointing at it, you wouldn't see it. Today I am finishing the small boxes made with the Gifkins jig, and as you can see in the photo, the shaping of the hinges is almost complete. 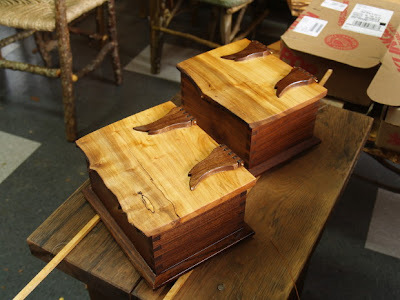 I will have these ready for final beauty shots on Monday and the article ready for American Woodworker later in the week. We have a lot to learn from comparisons. American politicians and economists in embracing the global economy have advocated a division of labor based on the same division of labor that takes place in modern corporations. You have the brains at the top, and the mindless, out of the know, labor at the bottom. In this scenario, the corporations would be the smart ones, and those in the third world, the labor, and the rest of us mindless consumers. We have had this idea that it is OK to have other nations providing the labor for our products, while completely ignoring the values inherent in making things for ourselves. As Otto Salomon said, the value of the child's work is not in the object made, but in the child. Can it not also be said with the same level of truth, that the real value of a nation's work is not in the products made but in the nation itself? Its character, will and resiliency? When people are put to work in mindful labor, the real creation is in the hearts and minds of those people. 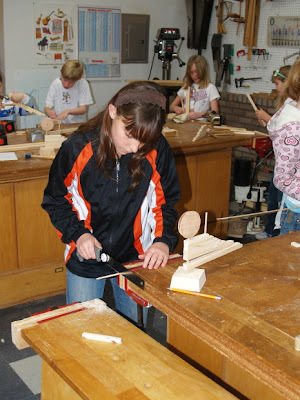 A young woman at a lathe, shaping wood... is it only the wood that takes new shape? We have been on a national head trip, and can so clearly see the results. But our economy can be restored when some people are put back to real work. I made the wooden hinges this morning. The Gifkins jig worked great for cutting the matching parts and I used a new technique, drilling both halves of the hinge at the same time for the hinge pins to fit. This was an idea suggested by one of my students and it worked. 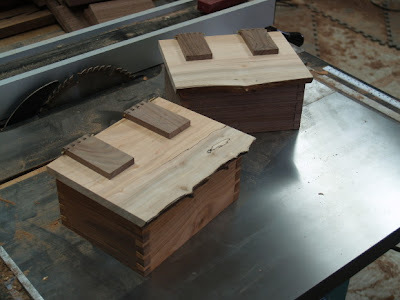 The photo above shows the hinges fit to the natural edged maple lids and placed on top of the boxes to get a glimpse of how the finished boxes will look. I will gently shape the ends of the lids. 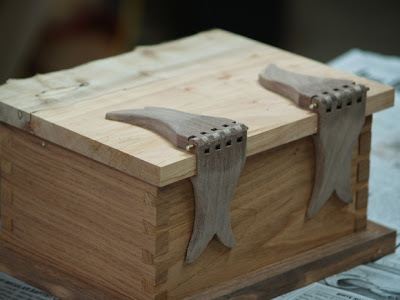 I shaped the hinges as shown below, but they still need more work, making them taper towards the ends for a more delicate look. The bases are glued up and ready for final shaping and fitting tomorrow. While Americans are losing jobs and homes, the CEOs of the nations largest banks met with members of the house of representatives yesterday and were subjected to a token of the outrage most Americans are feeling. Our hands are our most fundamental means of engaging in reality. We touch, we feel, we sense and create. But these are head honchos, out of touch with their own hands-on exploration and creativity, Idiot banking CEOs and the peanut head who took the 5th Amendment rather than explain to congress how his company's contamination of peanut paste led to the most massive recall of consumer products in American history. We have only ourselves to blame. We have allowed social stratification to exist based on levels of educational attainment, when we know that education often isolates children and adults from physical realities. Put people in situations in which they no longer have any sense but their own inflated sense of self and the current crisis is what we get. 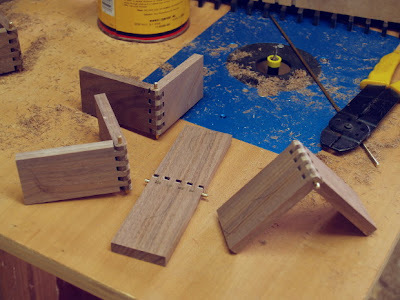 Now I'm beginning the process of making wooden hinges using the Gifkins jig. 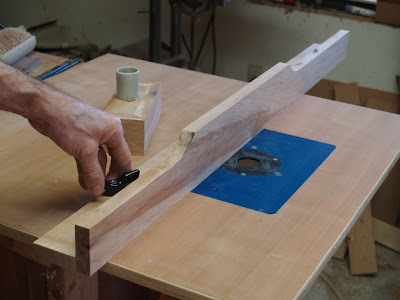 It is a bit more complicated to make a common box joint with the jig, than it is to cut dovetails. 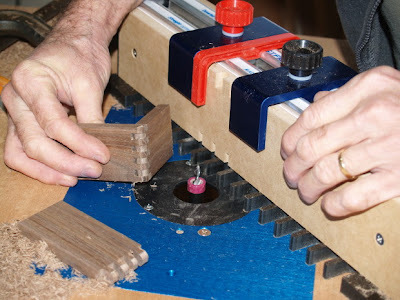 My wooden hinges are usually cut in the same manner box joints are formed. 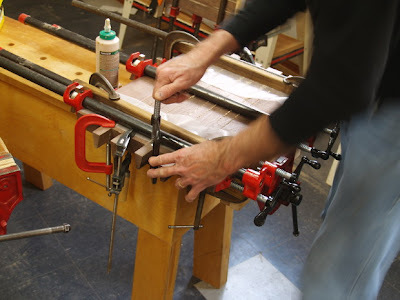 You have to use the red spacer shown in the photo above to provide for two different placements of the workpiece on the jig, and clamp the workpiece in two different positions to cut each side of the joint. Nevertheless, it does a great job as you can see in my test pieces. The purple spacer mounted on the router bearing is used to loosen the fit slightly to allow for the hinge to bend with less resistance. The jig comes with a variety of color coded bearings which allow you to fine tune the fit. Today in the woodshop at Clear Spring School, the students begin making a table of periodic elements, part of their study of chemistry. Is it good for things to be so easy? These are the first dovetails cut with my Gifkin jig. I wonder, is it good for things to be so easy? Where is the suffering we think of as being the sad and sorry lot of artists and craftsmen? I will add a natural edged spalted maple lid with hand crafted wooden hinges. 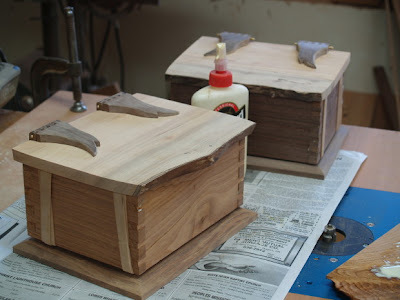 These boxes and the article for American Woodworker should be complete by the beginning of next week. The wood is Arkansas black walnut and the lighter wood in the box below is also walnut that has suffered from decay before the log was cut into lumber. If this is suffering, I can hardly wait to do more of it. Today I am doing my first test cuts using the Gifkins jig to cut dovetails. 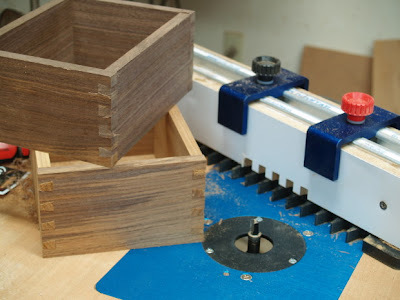 I am starting on an article for American Woodworker magazine demonstrating the use of the jig to both join the corners of the box and make the wooden hinges to attach the lid. So far so good. 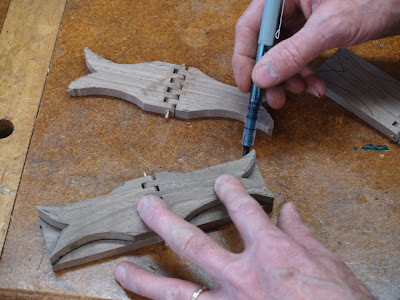 The Gifkins jig is a reversal of sorts from other dovetail jigs. 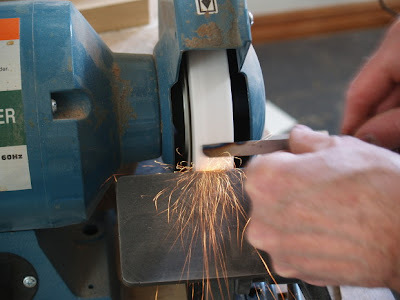 Instead of holding the router and guiding it to the jig and workpiece, with the Gifkins jig, you mount the workpiece in the jig and guide it into the table mounted router. This seems to be much easier than holding a router, and you can see very clearly what you are doing as you work. Inventiveness and tradition are equal parts in the wisdom of the hands. 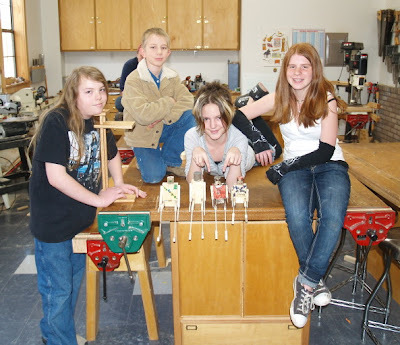 In the meantime, I'll have the 5th and 6th grade students in the wood shop this morning to work on their puppets, and the students from 7th through 10th to begin making book holders. Nicola Wood in the UK is making youtube videos showing craftsmen at work, and this one features her husband Robin Wood making a footbridge. A friend, reader and fellow blogger, Dana Jones sent the following link to a favorite blog telling of the Impractical Labor movement. Their motto is "as many hours as it takes." But is there anything really impractical about quality work? I am reminded of a friend whose teacher in India had informed her that "while people think that the spiritual path is impractical, it is actually the most practical." This could be seen when one takes a long term view, fully aware of the ramifications of each action. When you do shoddy, inattentive and careless work, you often have to do over, and it wasn't fulfilling in the first place, so you suffer twice. If we find joy in our work, is it impractical or more practical? It depends on your view. Toshio Odate in this month's Woodwork tells about the carpenters who laid down the new floor in his studio. They missed the joists with most of the nails. Odate was so distressed that he removed the poorly placed nails and did the job over. When asked why he didn't ask the carpenters back to do the job right, he told that he couldn't. He was ashamed for them. It is something, a heavy weight, that they carry in their hearts from job to job and home each night to infect the lives of their children. 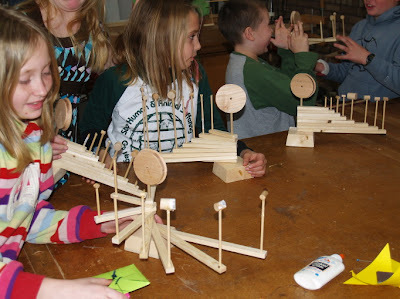 The Clear Spring School first and 2nd grade students finished their totem pole sections today, and the 3rd and 4th grade students worked on their models of the solar system. Both of these projects will be painted in their classrooms when complete. I may have shared some of this with my readers before, but model ship building is both a preservation of history and of technology. For those who practice the art, it can also be fulfillment arising through the hands. The model above is made by a friend, Gene Andes in Fayetteville, Arkansas, and you can see more of his wonderful models on his website. 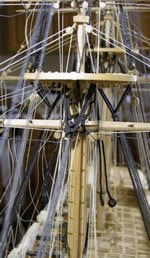 the cannon are turned from ebony and all the sheets and lines in the rigging are hand made to exact scale from linen thread. Learning, more than just a head-trip?